BACKGROUND AND AIM Intestinal epithelial cells (IEC) are thought to participate in the mucosal defence against bacteria and in the regulation of mucosal tissue homeostasis. Reactivity of IEC to bacterial signals may depend on interactions with immunocompetent cells. To address the question of whether non-pathogenic bacteria modify the immune response of the intestinal epithelium, we co-cultivated enterocyte-like CaCO-2 cells with human blood leucocytes in separate compartments of transwell cultures. METHODS CaCO-2/PBMC co-cultures were stimulated with non-pathogenic bacteria and enteropathogenic Escherichia coli. Expression of tumour necrosis factor alpha (TNF-α), interleukin (IL)-1β, IL-8, monocyte chemoattracting protein 1 (MCP-1), and IL-10 was studied by enzyme linked immunosorbent assays (cytokine secretion) and by semiquantitative reverse transcription-polymerase chain reaction. RESULTS Challenge of CaCO-2 cells with non-pathogenic E coli andLactobacillus sakei induced expression of IL-8, MCP-1, IL-1β, and TNF-α mRNA in the presence of underlying leucocytes. Leucocyte sensitised CaCO-2 cells produced TNF-α and IL-1β whereas IL-10 was exclusively secreted by human peripheral blood mononuclear cells. CaCO-2 cells alone remained hyporesponsive to the bacterial challenge. Lactobacillus johnsonii, an intestinal isolate, showed reduced potential to induce proinflammatory cytokines but increased transforming growth factor beta mRΝA in leucocyte sensitised CaCO-2 cells. TNF-α was identified as one of the early mediators involved in cellular cross talk. In the presence of leucocytes, discriminative activation of CaCO-2 cells was observed between enteropathogenicE coli and non-pathogenic bacteria. CONCLUSION The differential recognition of non-pathogenic bacteria by CaCO-2 cells required the presence of underlying leucocytes. These results strengthen the hypothesis that bacterial signalling at the mucosal surface is dependent on a network of cellular interactions. Epithelial cells that line the intestinal tract are considered to participate in the initiation and regulation of the mucosal immune response to bacteria by interacting with immune cells of the gut associated lymphoid tissue, lamina propria lymphocytes (LPL), and intraepithelial lymphocytes (IEL).1 It was shown that intestinal epithelial cells (IEC) may change phenotype as a consequence of stimulation by IEL derived soluble mediators such as interferon (IFN) γ.2 3 This is in agreement with the concept that activated IEC express higher levels of HLA class II molecules,4 classical class I, and non-classical HLA class Ib molecules, such as CD1d,5 6 the adhesion molecule ICAM-1,7 complement factors, and cytokine receptors.8-11 Furthermore, human IEC lines secrete chemokines, interleukin (IL)-1, IL-6, IL-7, granulocyte macrophage-colony stimulating factor, tumour necrosis factor alpha (TNF-α), transforming growth factor beta (TGF-β), and eicosanoids on stimulation with enteropathogenic Escherichia coli, Salmonella typhimurium,Yersinia enterocolitica,Shigella flexneri, and rotavirus but remain hyporesponsive to non-pathogenic commensal bacteria.12-20In the case of the colonised intestinal mucosa, however, protection against enteropathogens is mediated in part by the indigenous microflora.21 The importance of microflora derived host protection is evident by the higher susceptibility of germ free animals to intestinal infections.22 23 IEC may be implicated in the recognition of components of the intestinal microflora and the transduction of bacteria derived signals to resident mucosal immune cells. To investigate the effect of non-pathogenic bacteria on modulation of the cytokine response by IEC in vitro, enterocyte-like CaCO-2 cells were co-cultured with human blood leucocytes in transwell cell cultures. In this study, we demonstrated that commensal non-pathogenic bacteria of different origins have the ability to induce a distinct cytokine/chemokine response in leucocyte sensitised CaCO-2 cells and deliver a discriminative signal to underlying immunocompetent cells. We provide evidence that bidirectional cross talk between CaCO-2 cells and immunocompetent cells mediates recognition of non-pathogenic bacteria and is implicated in the maintenance of tissue homeostasis. Enteropathogenic Escherichia coli(EPEC) E2348/69, EPEC E2348/69 eaeAdeletion mutant CVD206 (kindly provided by Professor Dr J Hacker, Institute of Molecular Biology of Infections, University Würzburg, Germany), and the non-pathogenic E coli LTH 634 (Strain Collection, Institute of Food Technology, Hohenheim University, Germany) which lacks virulence factors commonly distributed in the species E coli,24 were grown in brain-heart infusion broth at 37°C.Lactobacillus johnsonii La 1 (Strain Collection, Nestlé Research Centre, Lausanne, Switzerland), a human intestinal isolate, was grown in MRS broth25 without acetate at 37°C. Lactobacillus sakei LTH 681 isolated from fermented food was grown in the same broth at 30°C. All bacteria were harvested by centrifugation (3000g, 15 minutes) after 24 hours of cultivation at the stationary growth phase. For some experiments bacteria were heat killed (95°C, 30 minutes). Bacteria were washed three times with phosphate buffered saline (PBS) (1×, pH 7.2, Gibco BRL, Basel, Switzerland) and subsequently diluted to obtain final cell densities of 1×106 and 1×107 colony forming units (cfu)/ml in RPMI 1640 medium (Gibco BRL). Human enterocyte-like CaCO-2 cells (passage 60-65) were seeded at a density of 2.5×105 cells/ml on 25 mm cell culture inserts (0.4 μm nucleopore size; Becton Dickinson, Basel, Switzerland). The inserts were placed into six well tissue culture plates (Nunc) and cultured 18–22 days at 37°C/10% CO2in DMEM (glutamine, high glucose; Amimed, Allschwil, Switzerland) supplemented with 20% decomplemented fetal calf serum (56°C, 30 minutes; Amimed), 1% MEM non-essential amino acids (Gibco BRL), 10 μg/ml gentamycin (Gibco BRL), and 0.1% penicillin/streptomycin (10 000 IU/ml/10 000 UG/ml; Gibco BRL). Cell culture medium was changed every second day until the cells were fully differentiated (day 21). Transepithelial electrical resistance (TEER) was determined continuously in confluent CaCO-2 monolayers using a MultiCell-ERS electrode (voltmeter/ohmmeter). Human peripheral blood mononuclear cells (PBMC) from healthy volunteers were purified from buffy coats (Blood Transfusion Centre, Lausanne, Switzerland) using Ficoll-Hypaque (1077, Pharmacia, Dübendorf, Switzerland) gradient centrifugation (500g, 30 minutes). PBMC were taken from the interface and washed five times with RPMI 1640 and finally diluted (2×106 cells/ml) in RPMI 1640 containing 20% decomplemented human AB serum (56°C, 30 minutes; Sigma, St Louis, Missouri, USA) and gentamycin (150 μg/ml), henceforth referred to as culture medium. Gentamycin free culture medium was used where indicated. Tissue culture inserts covered with CaCO-2 cell monolayers were washed twice with prewarmed RPMI 1640 medium and transferred to six well tissue culture plates. Culture medium (2 ml) was added to the apical and basolateral compartments of the transwell cell culture system. In CaCO-2/leucocyte co-cultures, 2 ml of freshly purified PBMC (2×106 cells/ml) were added to the basolateral part of the culture plates. The apical surface of CaCO-2 monolayers was challenged by addition of 1×106 or 1×107 cfu/ml of non-pathogenicE coli, L johnsonii, L sakei, or lipopolysaccharide (LPS) (1 μg/ml, Serotype O111:B4, Sigma), respectively. Gentamycin was added apically (150 μg/ml) to the cell culture where indicated. In accordance with Canil and colleagues,26 infection of CaCO-2 cells with EPEC strains E2348/69 and CVD206 was performed for four hours in the absence of gentamycin. Thereafter, gentamycin was added (150 μg/ml) to prevent (i) bacterial growth and (ii) secretion of bacterial metabolites. Cytokine expression in CaCO-2 cells was controlled by stimulation with IL-1β (10 ng/ml, Sigma). Culture medium (no treatment) was used as a negative control. After stimulation for 6–36 hours (37°C, 10% CO2), the CaCO-2 cells were collected, washed once with cold PBS (1×, pH 7.2), and lysed in denaturation solution for RNA extraction (Micro RNA Isolation Kit, Stratagene). Cellular lysates were stored at −20°C. Cell culture supernatants were collected separately from the apical and basolateral compartments and frozen at −20°C until further analysis. The immune response of CaCO-2 cells and underlying PBMC was monitored by analysis of cytokine gene transcription (TNF-α, IL-8, monocyte chemoattracting protein 1 (MCP-1), TGF-β, IL-12, IFN-γ, IL-4, IL-10) using a reverse transcription-polymerase chain reaction (RT-PCR) technique and determination of cytokine secretion in cell culture supernatants using an ELISA technique. To investigate the role of TNF-α and IL-1β in the cellular cross talk of CaCO-2/PBMC co-cultures, challenging experiments were performed in the presence of neutralising anti-TNF-α (10 μg/ml, IKD9, ImmunoKontakt, Frankfurt, Germany) or anti-IL-1β (500-M01B, BioConcept, Allschwil, Switzerland) monoclonal antibodies (mAbs) in the basolateral compartment. The experiments included isotype control antibodies. Thereafter, CaCO-2 cells were analysed for TNF-α and IL-8 mRNA expression using RT-PCR. To control the potential migration of immunostimulatory bacterial products into the basolateral compartment, different concentrations of LPS (0, 0.1, 1, 100 μg/ml) were added to the cell culture inserts in the absence and presence of CaCO-2 cells. Measuring TEER (Ω cm2) monitored the intact barrier function of CaCO-2 cell monolayers. To investigate the potential of non-pathogenic bacteria and EPEC strains to attach to CaCO-2 cells, adherence assays were performed as described previously by Bernet and colleagues.27 Briefly, bacteria were metabolically labelled for 24 hours by addition of [14C] acetic acid (94 mCi/mmol, 100 μCi/10 ml tube; Amersham) for non-pathogenic E coli and [3H] adenine (24 Ci/mmol, 100 mCi/10 ml tube; Amersham) for L johnsonii and L sakei. CaCO-2 cells were incubated for one hour with bacteria (1×108), washed three times with PBS and dissolved in 0.2 N NaOH. The rate of bacterial adhesion to CaCO-2 cells in the absence and presence of leucocytes after one hour of incubation was evaluated by liquid scintillation counting or plating on agar. Invasion of CaCO-2 cells was controlled according to the method described by Canil and colleagues.26 Briefly, CaCO-2 cell monolayers were challenged for four hours with live bacteria in the absence of antibiotics. The CaCO-2 cell monolayer was washed twice with PBS (1×) and culture medium containing gentamycin (150 μg/ml) was added. After one hour of incubation the CaCO-2 cell monolayer was washed three times with PBS and lysed. Bacterial numbers were determined by plating on agar. To determine to what extent CaCO-2 cells participate in the secretory cytokine response of the co-culture system, transfer experiments were performed. CaCO-2 cells were incubated with bacteria in CaCO-2 monocultures and CaCO-2/leucocyte co-cultures for 12 hours. Thereafter the CaCO-2 cell monolayers on the cell culture inserts were washed twice basolaterally and transferred to fresh culture medium. Cell culture supernatants of CaCO-2 cells and leucocyte sensitised CaCO-2 cells were collected after another 24 hours and analysed for secretion of cytokines. Total RNA from CaCO-2 cells and PBMC was isolated using the acid guanidinium thiocyanate/phenol/chloroform method according to the supplier's recommendation (Micro RNA Isolation Kit, Stratagene). Total RNA (0.5 μg), 1 mM of each dNTP, 2.5 U/μl MuLV reverse transcriptase (Perkin Elmer, New Jersey, USA), and specific 3′ primers coding for the human cytokines TNF-α, IL-1β, IL-8, MCP-1, IL-12, IFN-γ, IL-4, IL-10, TGF-β, and β-actin were incubated at 42°C for 30 minutes. PCR amplification was performed in a total volume of 50 μl using Taq polymerase (Perkin Elmer) and specific cytokine primers. After initial denaturation at 94°C for one minute, 30 cycles of denaturation (94°C, one minute), primer annealing (60°C, one minute), and extension (72°C, one minute) were performed (PTC-100 Thermocycler, MJ Research Inc, Naltham, USA). PCR products were subjected to gel electrophoresis on 2% agarose gels containing 1×Tris borate EDTA and visualised by staining with ethidium bromide. The oligonucleotide primers used were as follows: TNF-α (5′) 5′-CAGAGGGAAGAGTTCCCCAG-3′ (3′) 5′-CCTTGGTCTGGTAGGAG-ACG-3′ (product length 324 base pairs (bp)); IL-1β (5′) 5′-GATCATCTGTCTCTGAATCA-3′ (3′) 5′-TCCAGATTATGTAATGCAGC-3′ (387 bp); IL-8 (5′) 5′-CTGGCCGTGGCTCTC TTGGCAG-CCTTCCTG-3′ (3′) 5′-GGCAA CCCTACAACAGACCCACACAATA-CA-3′ (395 bp); MCP-1 (5′) 5′-TCTGTGCCTG CTGCTCATAGC-3′ (3′) 5′-GGGT-AGAAC TGTGGTTCAAGAGG-3′ (510 bp); IL-12 p40 (5′) 5′-CGTAGAATTGGA-TTGGTAT CCGG-3′ (3′) 5′-GCTCTTGC-CCTGGAC CTGAACGC-3′ (702 bp); IFN-γ (5′) 5′-ATATCTTGGCTTTTCAGCTC-3′ (3′) 5′-CTCCTTTTTCGCTTCCCTGT-3′ (489 bp); IL-4 (5′) 5′-GTTCTTCCTGCTAGC ATGTG-3′ (3′) 5′-ATTTCTCTCTCATGA TCGTC-3′ (411 bp); IL-10 (5′) 5′-TGATGTCTGGGTC-TTGGTTC-3′ (3′) 5′-GCCTAACATGCT-TCGAGATC-3′ (204 bp); TGF-β (5′) 5′-CTC-CGAGAAGCGG TACCTGAAC-3′ (3′) 5′-CACTTGCAGTG TGTTATCCCT-3′ (288 bp); and β-actin (5′) 5′-GGCGACGAGGCCCAGGAGCAAGAG AGGCATC-3′ (3′) 5′-CGATTTCCC-GCTC GGCCGTGGTGGTGAAGC-3′ (460 bp). Quantification of TNF-α, IL-1β, IL-10, IL-4, IFN-γ, and IL-12 (ImmunoKontact) was performed by enzyme linked immunosorbent assay (ELISA) according to the manufacturer's protocols. Values are given as mean (SD) of triplicate measurements. All results were confirmed for at least three blood donors in independent experiments. Significance was tested applying the Mann-Whitney U test (Statistica, Statsoft). The integrity of the CaCO-2 cell monolayers was a prerequisite for studying the recognition of non-pathogenic bacteria by IEC/leucocyte co-cultures. As shown in table 1, TEER (Ω cm2) was kept constant after bacterial challenge of CaCO-2 cells in the absence and presence of underlying PBMC, thus confirming the intact barrier function of IEC during the course of the experiments. Although TEER decreased slightly for L johnsonii, this was not significant (p>0.05). Cell viability in CaCO-2 cell monolayers was >95% on bacterial challenge (24 hours), as determined by trypan blue exclusion. Adhesion assays performed in the presence and absence of underlying PBMC revealed a similar ability of non-pathogenicE coli, L johnsonii, and L. sakei to attach to CaCO-2 cells (table 2). Differentiated CaCO-2 monolayers were challenged for 16 hours with non-pathogenic E coli, L johnsonii, and L sakei. In the absence of PBMC, non-pathogenic bacteria did not induce mRNA expression of the proinflammatory chemokines IL-8 or MCP-1. The soluble gram negative cell wall component LPS failed to induce chemokine mRNA expression. In contrast, IL-1β (10 ng/ml) significantly induced IL-8 and MCP-1 mRNA expression, demonstrating the general responsiveness of CaCO-2 cells to soluble mediators (fig 1). Remarkably, when CaCO-2 cells were co-cultured in the presence of PBMC, a differential response to non-pathogenic bacteria was observed. Challenge of leucocyte sensitised CaCO-2 cells using 106 or 107 cfu/mlE coli or L sakei, respectively, elicited IL-8 and MCP-1 mRNA expression. 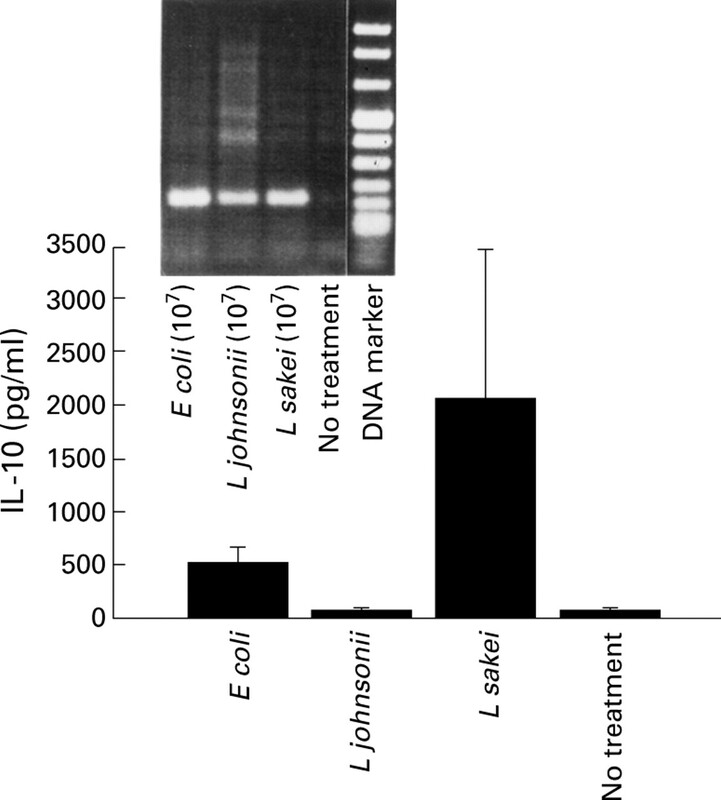 The inductive effect of L johnsonii was lower compared with the other non-pathogenic bacteria. IL-12, IL-10, IL-4, or IFN-γ mRNA was not induced by non-pathogenic bacteria or IL-1β (data not shown). Differential chemokine expression in CaCO-2 cells. Reverse transcription-polymerase chain reaction (RT-PCR) analysis was used to determine monocyte chemoattracting protein 1 (MCP-1) (A) and interleukin (IL)-8 (B) mRNA expression in CaCO-2 cells on stimulation of CaCO-2/leucocyte co-cultures or CaCO-2 cells alone with non-pathogenic E coli, L johnsonii, and L sakei (16 hours, 106 and 107 cfu/ml), respectively. Lipopolysaccharide (LPS, 1 μg/ml), IL-1β (10 ng/ml) and culture medium (no treatment) were used as controls. Results represent one of three independent experiments. TNF-α and IL-1β are primary mediators of immune stimulation and inflammatory responses which have been implicated in both beneficial and injurious conditions. 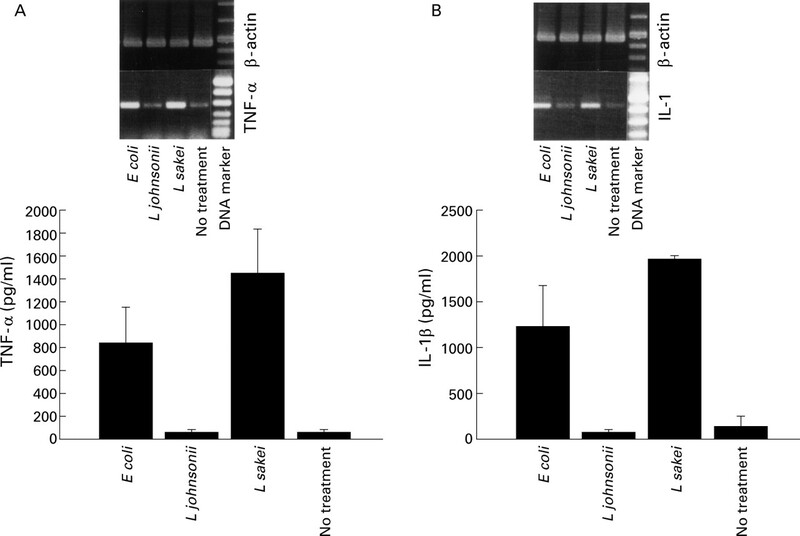 As shown in fig 2, TNF-α and IL-1β mRNA expression was strongly increased in leucocyte sensitised CaCO-2 cells only after challenge with non-pathogenicE coli and L sakei(1×107 cfu/ml). In contrast, L johnsonii induced neither TNF-α nor IL-1β mRNA expression above control levels. Notably, CaCO-2 cells alone remained unresponsive to bacterial challenge (data not shown). Bacteria induced tumour necrosis factor alpha (TNF-α) and interleukin (IL)-1β response by CaCO-2/leucocyte co-cultures. Stimulation of CaCO-2/leucocyte co-cultures with non-pathogenic E coli, L johnsonii, and L sakei (16 hours, 107 cfu/ml). Secretion of TNF-α (A) and IL-1β (B) into the basolateral compartment was determined (bar charts). Culture medium (no treatment) was used as a control. Reverse transcription-polymerase chain reaction (RT-PCR) analysis was used to determine expression of TNF-α (A) and IL-1β (B) mRNA in leucocyte sensitised CaCO-2 cells. Data are mean (SD) of triplicate values and represent one of three independent experiments. Secretion of TNF-α and IL-1β (fig 2, bar charts) followed the same induction pattern as shown at the level of mRNA expression. TNF-α and IL-1β were exclusively detected in the basolateral compartment and significantly increased on challenge of co-cultures with non-pathogenicE coli and L sakei. L johnsonii did not induce TNF-α or IL-1β secretion above control levels. The variation in cytokine response obtained with different blood donors (n=3) ranged between 33% and 128% depending on the bacteria used for stimulation. By challenging the CaCO-2/PBMC co-cultures with non-pathogenicE coli (1×107 cfu/ml) for 12 hours and thereafter separating the two cell compartments for another 24 hours (transfer experiment), secretion of TNF-α and IL-1β by conditioned CaCO-2 cells and PBMC was studied. 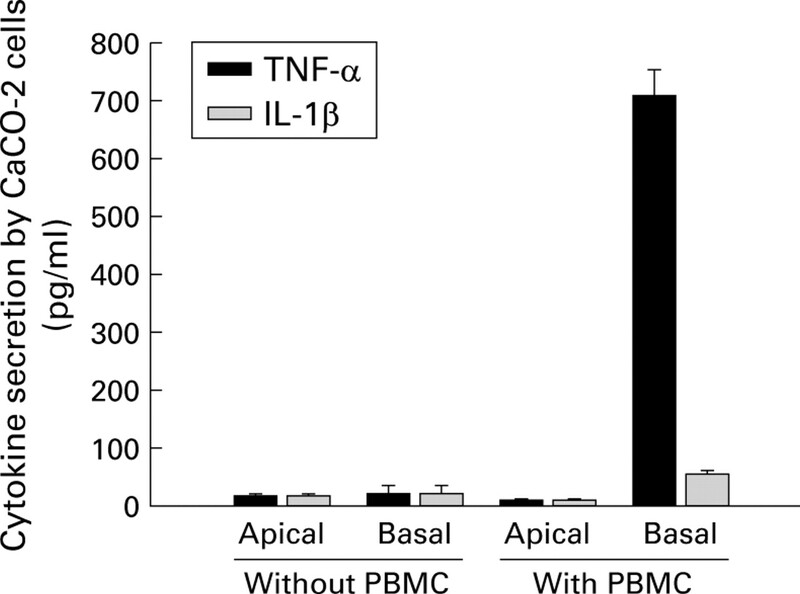 As shown in fig 3, TNF-α was produced in significant levels by PBMC sensitised CaCO-2 cells (708 pg/ml) whereas only low levels of IL-1β were detected (55 pg/ml). Increased production of TNF-α (2492 pg/ml) and IL-1β (859 pg/ml) was detected in conditioned PBMC (data not shown). Thus CaCO-2 cells substantially contributed (1:4) to the total amount of TNF-α. Culture medium alone did not induce cytokine secretion. No cytokine secretion occurred after bacterial stimulation of CaCO-2 cells alone, suggesting that cytokine expression by CaCO-2 cells in response to certain non-pathogenic bacteria may be induced by PBMC derived soluble mediators, as cell to cell interactions between IEC and leucocytes did not occur. No TNF-α or IL-1β was detectable in the apical cell culture supernatants, demonstrating polarised secretion by CaCO-2 cells. Moreover, activation of CaCO-2 cells by non-pathogenic bacteria did not induce secretion of IFN-γ, IL-4, or IL-12 by underlying PBMC (data not shown). Polarised secretion of tumour necrosis factor alpha (TNF-α) and interleukin (IL)-1β by leucocyte sensitised CaCO-2 cells. Stimulation of CaCO-2/leucocyte co-cultures or CaCO-2 cells alone with non-pathogenic E coli (107 cfu/ml). After 12 hours of incubation, CaCO-2 cells were transferred to fresh culture medium. After an additional 24 hours of incubation, secretion of TNF-α and IL-1β by leucocyte sensitised CaCO-2 cells was determined in the apical and basolateral compartments (transfer experiment). Controls (no treatment) did not induce cytokine secretion. Data are mean (SD) of triplicate values and represent one of three independent experiments. Addition of LPS (0, 0.1, 1, 10 μg/ml) to the cell culture inserts in the absence of CaCO-2 cells induced secretion of TNF-α by PBMC (17, 2793, 2175, 1717 pg/ml, respectively). In contrast, LPS (0.1, 1, 10 μg/ml) did not induce secretion of TNF-α by PBMC in the presence of CaCO-2 cell monolayers suggesting that migration of bacterial products across the epithelial barrier did not occur. The balance between inflammatory and regulatory cytokines is of crucial importance in the control of normal homeostasis and gut immunity. TGF-β and IL-10 are important inhibitory cytokines, shown to downregulate the inflammatory cytokine response. In contrast with IL-10, low levels of mRNA coding for the regulatory cytokine TGF-β were induced in CaCO-2 cells, regardless of the bacteria used. In leucocyte sensitised CaCO-2 cells, however, discernible enhanced TGF-β mRNA expression was detected exclusively withL johnsonii (107 cfu/ml). Culture medium and LPS did not induce TGF-β mRNA expression above control levels (fig 4). Moreover, the presence of underlying leucocytes did not induce expression of IL-10 mRNA in activated CaCO-2 cells (data not shown). Thus IL-10 was secreted exclusively by PBMC after challenge of CaCO-2 cells with non-pathogenic E coli(511 pg/ml) and L sakei (1221 pg/ml). Although L johnsonii upregulated IL-10 at the level of mRNA expression, protein secretion was not observed (fig5A). Differential expression of transforming growth factor beta (TGF-β) mRNA in CaCO-2 cells. Reverse transcription-polymerase chain reaction (RT-PCR) analysis was used to determine TGF-β mRNA expression in CaCO-2 cells on stimulation of CaCO-2/leucocyte co-cultures or CaCO-2 cells alone with non-pathogenic E coli, L johnsonii, and L sakei (16 hours, 106 and 107cfu/ml), respectively. Lipopolysaccharide (LPS, 1 μg/ml), interleukin (IL)-1β (10 ng/ml), and culture medium (no treatment) were used as controls. Results represent one of three independent experiments. Induction of interleukin (IL)-10 response by CaCO-2/leucocyte co-cultures. 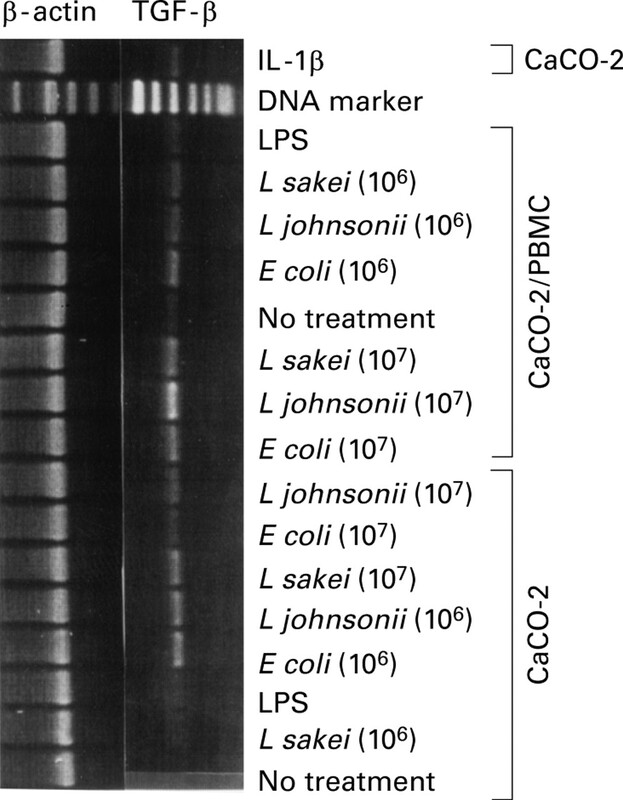 Secretion of IL-10 was determined in the basolateral compartment on stimulation of CaCO-2/leucocyte co-cultures with non-pathogenic E coli, L johnsonii, and L sakei (16 hours, 107 cfu/ml), respectively (bar charts). Culture medium (no treatment) was used as a control. Reverse transcription-polymerase chain reaction (RT-PCR) analysis was used to determine IL-10 mRNA expression in conditioned PBMC. Data are mean (SD) of triplicate values and represent one of three independent experiments. As TNF-α and IL-1β were secreted from conditioned CaCO-2 cells and PBMC after challenge with non-pathogenic E coli and L sakei, the role of these cytokines in cellular cross talk was investigated. CaCO-2/PBMC co-cultures were challenged with the non-pathogenicE coli (1×107 cfu/ml) in the presence and absence of neutralising anti-TNF-α or anti-IL-1β mAb (10 μg/ml). 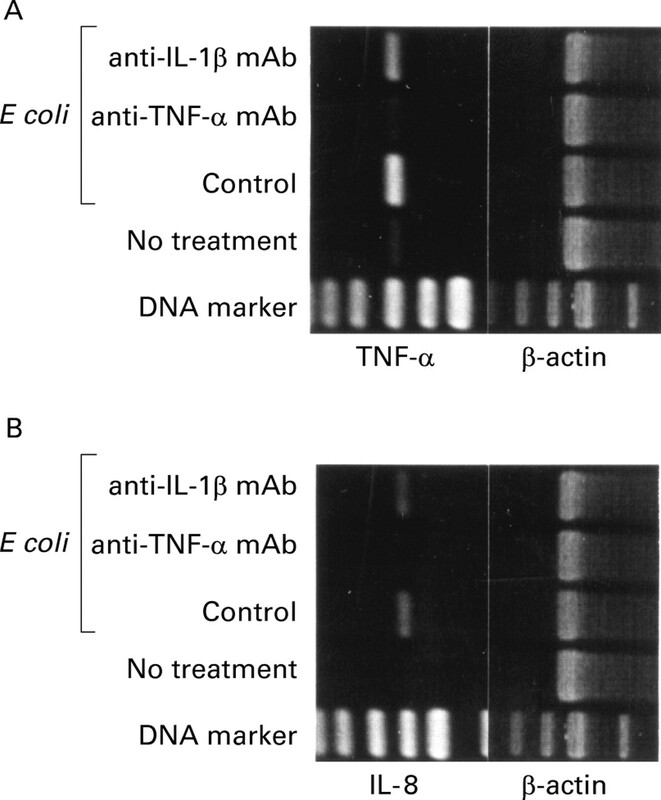 Remarkably, the presence of anti-TNF-α mAb completely abolishedE coli mediated expression of TNF-α and IL-8 mRNA in CaCO-2 cells (fig 6A, B). The presence of anti-IL-1β mAb weakly reduced TNF-α and IL-8 gene transcripts, demonstrating that TNF-α was the predominant cytokine implicated in the cellular cross talk. Isotype control antibodies did not affect cytokine mRNA expression in CaCO-2 cells (data not shown). Neutralisation of tumour necrosis factor alpha (TNF-α) and interleukin (IL)-1β in CaCO-2/leucocyte co-cultures. CaCO-2/ leucocyte co-cultures were stimulated with non-pathogenic E coli (16 hours, 107 cfu/ml) in the presence of neutralising anti-TNF-α monoclonal antibody (mAb) or IL-1β mAb (10 μg/ml). A positive control was performed in the absence of neutralising antibodies. Challenge of CaCO-2/leucocyte co-cultures with culture medium alone was used as a negative control. Reverse transcription-polymerase chain reaction (RT-PCR) analysis was used to determine TNF-α (A) and IL-8 (B) mRNA expression in CaCO-2 cells. Results represent one of three independent experiments. Enteropathogenic E coli were shown to be the major cause of infant diarrhoea.28 Infection of IEC lines by enteropathogenic E coli induced expression of cytokines and chemokines in the model epithelium. To compare differences in bacterial induced activation of IEC, CaCO-2/leucocyte co-cultures were challenged with live/heat killed enteropathogenic E coli and commensal bacteria (1×107 cfu/ml). The initial interaction (four hours) between bacteria and CaCO-2 cells was allowed to take place in the absence of gentamycin. TNF-α mRNA expression was monitored in CaCO-2 cells after 6, 16, and 36 hours of incubation. Invasion of EPEC wild-type strain E23458/69 in CaCO-2 cells ranged between 104 and 105 cfu/ml/5×105 CaCO-2 cells. For the EPEC eaeA deletion mutant CVD206, which lacks the outer membrane protein intimin, its ability to invade CaCO-2 cells was significantly reduced (3 log). Non-pathogenicE coli and lactobacilli did not penetrate CaCO-2 cells. Infection of CaCO-2/leucocyte co-cultures with both EPEC strains induced expression of TNF-α mRNA in CaCO-2 cells at the three times (6, 16, and 36 hours). In contrast, non-pathogenic bacteria (E coli, L johnsonii, L sakei) exclusively induced TNF-α mRNA expression after 16 hours of incubation. The cytokine pattern induced by live non-pathogenic bacteria was similar to that observed with gentamycin killed bacteria, although slightly increased TNF-α mRNA expression was observed forL johnsonii. 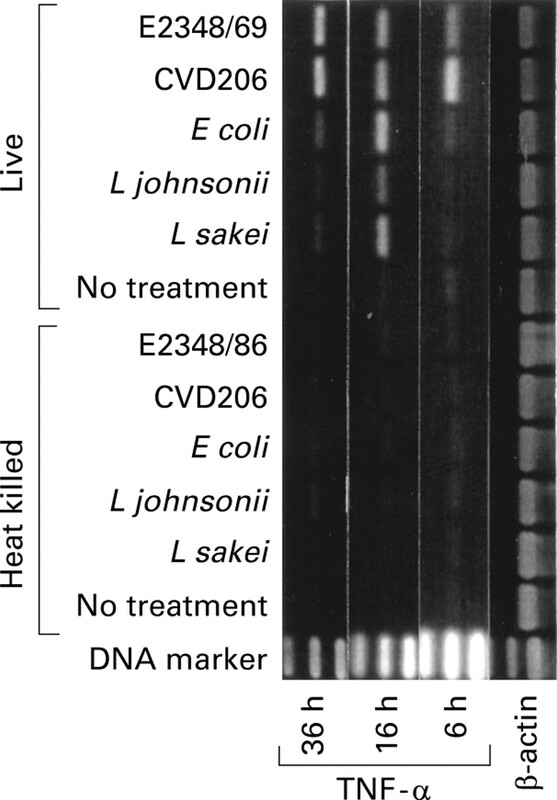 Remarkably, heat killed bacteria did not induce cytokine mRNA expression (fig 7). Infection of CaCO-2 monocultures with EPEC strain E2348/69 and CVD206 induced TNF-α mRNA expression in IEC. No cytokine response was observed with non-pathogenic bacteria (data not shown). Differential induction of tumour necrosis factor alpha (TNF-α) mRNA by leucocyte sensitised CaCO-2 cells stimulated with enteropathogenic E coli and non-pathogenic bacteria. Stimulation of CaCO-2/leucocyte co-cultures with live or heat killed (95°C/30 minutes) EPEC strain E2348/69 and its eaeA deletion mutant CVD206, and non-pathogenic E coli, L johnsonii, and L sakei (107cfu/ml) for four hours in the absence of gentamycin (150 μg/ml). Culture medium (no treatment) was used as a control. Expression of TNF-α mRNA in CaCO-2 cells was determined after 6, 16, and 36 hours of incubation by reverse transcription-polymerase chain reaction (RT-PCR) analysis. Results represent one of three independent experiments. In conclusion, we have demonstrated a pivotal role for immune cells in the sensitisation of human differentiated CaCO-2 cells in recognising signals originating from non-pathogenic bacteria. Moreover, it was shown that IEC delivered a discriminative signal to neighbouring immune cells by secretion of soluble messengers. Although PBMC do not exactly represent intestinal mucosal immune cells, such as LPL or intestinal IEL,56 57 lamina propria T cells have a similar CD4:CD8 ratio to that found in the periphery58 and are predominantly αβTCR+ T cells. Thus PBMC may be partially representative of LPL and have previously been used to study the effect of immunocompetent cells on the physiology of human IEC lines.59 Hence the IEC/leucocyte co-culture model could be an additional60 tool to characterise the role of the intestinal epithelium in response to components of the intestinal microflora. (1997) Epithelial cells as sensors for microbial infection. J Clin Invest 100:6–10. (1984) Intraepithelial lymphocytes modulate Ia expression by intestinal epithelial cells. J Immunol 132:2244–2252. (1998) The regulation and functional consequence of proinflammatory cytokine binding on human intestinal epithelial cells. J Immunol 161:3675–3684. (1998) Highly polarized HLA class II antigen processing and presentation by human intestinal epithelial cells. J Clin Invest 102:792–803. (1991) Expression of a nonpolymorphic MHC class I-like molecule, CD1D, by human intestinal epithelial cells. J Immunol 147:2518–2524. (1990) Expression of the thymus leukemia antigen in mouse intestinal epithelium. Proc Natl Acad Sci USA 87:9727–9731. (1996) Infection of human intestinal epithelial cells with invasive bacteria upregulates apical intercellular adhesion molecule-1 (ICAM-1) expression and neutrophil adhesion. J Clin Invest 98:572–583. (1993) Differential cytokine regulation of complement C3, C4, and factor B synthesis in human intestinal epithelial cell line, Caco-2. J Immunol 151:4239–4247. (1993) Functional interleukin-2 receptors on intestinal epithelial cells. J Clin Invest 92:527–532. (1993) Growth inhibition of a human colorectal carcinoma cell line by interleukin 1 is associated with enhanced expression of gamma-interferon receptors. Cancer Res 53:636–640. (1995) Human intestinal epithelial cells express functional cytokine receptors sharing the common gamma c chain of the interleukin 2 receptor. Proc Natl Acad Sci USA 92:8353–8357. (1998) Rotavirus infection of cultured intestinal epithelial cells induces secretion of CXC and CC chemokines. Gastroenterology 114:947–955. (1997) Role of intestinal epithelial cells in the host secretory response to infection by invasive bacteria. Bacterial entry induces epithelial prostaglandin h synthase-2 expression and prostaglandin E2 and F2alpha production. J Clin Invest 100:296–309. (1995) A distinct array of proinflammatory cytokines is expressed in human colon epithelial cells in response to bacterial invasion. J Clin Invest 95:55–65. (1993) Salmonella typhimurium attachment to human intestinal epithelial monolayers: transcellular signalling to subepithelial neutrophils. J Cell Biol 123:895–907. (1998) Requirement of the Shigella flexneri virulence plasmid in the ability to induce trafficking of neutrophils across polarized monolayers of the intestinal epithelium. Infect Immun 66:4237–4243. (1998) Apical secretion of a pathogen-elicited epithelial chemoattractant activity in response to surface colonization of intestinal epithelia by Salmonella typhimurium. J Immunol 160:455–466. (1997) Activation of NF-kappaB in intestinal epithelial cells by enteropathogenic Escherichia coli. Am J Physiol 273:C1160–C1167. (1994) Colonic epithelial cell lines as a source of interleukin-8: stimulation by inflammatory cytokines and bacterial lipopolysaccharide. Immunology 81:85–91. (1996) Differential secretion of interleukin-8 by human epithelial cell lines upon entry of virulent or nonvirulent Yersinia enterocolitica. Infect Immun 64:2106–2113. (1992) Molecular and cellular basis of immune protection of mucosal surfaces. Physiol Rev 72:853–879. (1975) Immune responses of specific pathogen-free and gnotobiotic mice to antigens of indigenous and nonindigenous microorganisms. Infect Immun 11:320–329. (1978) Growth of salmonellae in orally infected germfree mice. Infect Immun 21:41–47. (1996) Characterization of Escherichia coli strains isolated from environmental water habitats and from stool samples of healthy volunteers. Res Microbiol 147:625–635. (1960) A medium for the cultivation of lactobacilli. J Appl Bacteriol 23:130–135. (1993) Enteropathogenic Escherichia coli decreases the transepithelial electrical resistance of polarized epithelial monolayers. Infect Immun 61:2755–2762. (1994) Lactobacillus acidophilus LA 1 binds to cultured human intestinal cell lines and inhibits cell attachment and cell invasion by enterovirulent bacteria. Gut 35:483–489. (1984) Enteropathogenic Escherichia coli of classic serotypes associated with infant diarrhea: epidemiology and pathogenesis. Epidemiol Rev 6:31–51. (1996) Microbial colonization influences composition and T-cell receptor V beta repertoire of intraepithelial lymphocytes in rat intestine. Immunology 89:494–501. (1995) Immunomodulation of the gnotobiotic mouse through colonization with lactic acid bacteria. Adv Mucosal Immunol, pp 465–467. (1992) Identification and characterization of rat intestinal lamina propria cells: consequences of microbial colonization. Vet Immunol Immunopathol 34:127–138. (1996) Tolerance towards resident intestinal flora in mice is abrogated in experimental colitis and restored by treatment with interleukin-10 or antibodies to interleukin-12. Eur J Immunol 26:934–938. (1971) Use of gnotobiotic pigs for research on enteritis associated with Escherichia coli. Proc R Soc Med 64:436–439. (1995) Experimental models of inflammatory bowel disease. Gastroenterology 109:1344–1367. (1997) Pathogenesis and immune mechanisms of chronic inflammatory bowel diseases. Am J Gastroenterol 92:5–11S. (1997) Cryptosporidium parvum infection of human intestinal epithelial cells induces the polarized secretion of C-X-C chemokines. Infect Immun 65:5067–5073. (1997) Secretion of proinflammatory cytokines by epithelial cells in response to Chlamydia infection suggests a central role for epithelial cells in chlamydial pathogenesis. J Clin Invest 99:77–87. (1996) Bacterial modulins: a novel class of virulence factors which cause host tissue pathology by inducing cytokine synthesis. Microbiol Rev 60:316–341. (1999) Lactobacillus species prevents colitis in interleukin 10 gene-deficient mice. Gastroenterology 116:1107–1114. (1993) Cytokine modulation of intestinal epithelial cell restitution: central role of transforming growth factor beta. Gastroenterology 105:1323–1332. (1994) Regulation of intestinal epithelial barrier function by TGF-beta 1. Evidence for its role in abrogating the effect of a T cell cytokine. J Immunol 153:5730–5739. (1998) Oral delivery of group A streptococcal cell walls augments circulating TGF-beta and suppresses streptococcal cell wall arthritis. J Immunol 161:6297–6304. (1991) Antigen-driven bystander suppression after oral administration of antigens. J Exp Med 174:791–798. (1992) Suppressor T cells generated by oral tolerization to myelin basic protein suppress both in vitro and in vivo immune responses by the release of transforming growth factor beta after antigen-specific triggering. Proc Natl Acad Sci USA 89:421–425. (1994) Stimulation of lamina propria lymphocytes by intestinal epithelial cells: evidence for recognition of nonclassical restriction elements. J Exp Med 179:943–950. (1992) The pathophysiology of tumor necrosis factors. Annu Rev Immunol 10:411–452. (1998) Cytokines in brain ischemia—the role of TNF alpha. Cell Mol Neurobiol 18:695–701. (1999) The potential role of chemokines and inflammatory cytokines in periodontal disease progression. Clin Infect Dis 28:482–490. (1998) TNF-induced enterocyte apoptosis in mice is mediated by the TNF receptor 1 and does not require p53. Eur J Immunol 28:3499–3505. (1999) Tumor necrosis factor alpha antibody (infliximab) therapy profoundly down-regulates the inflammation in Crohn's ileocolitis. Gastroenterology 116:22–28. (1996) Cytokines and intestinal inflammation. Transplant Proc 28:2442–2443. (1997) Interleukin-10 in the intestine. Gut 41:274–275. (1998) IL-4, IL-10 and IL-13 down-regulate monocyte-chemoattracting protein-1 (MCP-1) production in activated intestinal epithelial cells. Clin Exp Immunol 111:152–157. (1995) Immunoregulatory role of IL-10 in patients with inflammatory bowel disease. Gastroenterology 108:1434–1444. (1991) Cytotoxic differentiation of mouse gut thymodependent and independent intraepithelial T lymphocytes is induced locally. Correlation between functional assays, presence of perforin and granzyme transcripts, and cytoplasmic granules. J Exp Med 173:1549–1552. (1994) Oligoclonal repertoire of the CD8 alpha alpha and the CD8 alpha beta TCR-alpha/beta murine intestinal intraepithelial T lymphocytes: evidence for the random emergence of T cells. J Exp Med 180:1345–1358. (1997) The anatomical basis of intestinal immunity. Immunol Rev 156:145–166. (1996) T cell-monocyte interactions regulate epithelial physiology in a coculture model of inflammation. Am J Physiol 270:C418–C428. (1997) Conversion by Peyer's patch lymphocytes of human enterocytes into M cells that transport bacteria. Science 277:949–952.